When working with sick patients we often throw the terms "sepsis" and "septic shock" about but do we really know what they mean? It doesn't help that until recently a number of definitions existed for both. But in 2016, a consensus was reached and a single set of definitions has finally emerged. 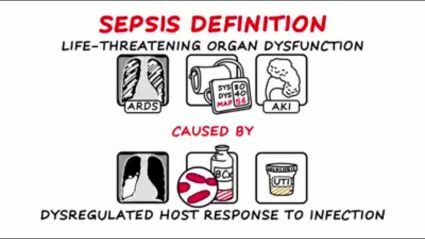 Sepsis is now defined as, "life threatening organ dysfunction caused by a dysregulated host response to infection". The new definition of sepsis will probably sound familiar. It's simply "life-threatening organ dysfunction caused by a dysregulated host response to infection". But what's new is the way that "organ dysfunction" is now measured. Rather than previous scoring systems that used lots of symptoms, signs and clinical observations, organ dysfunction is now measured by the Quick SOFA (qSOFA) Score*. As the title suggests the qSOFA is quick! There are three criteria - a respiratory rate of 22 or more breaths per minute, an altered mental state and a systolic blood pressure of 100mmHg or less. To achieve "organ dysfunction" a patient has to have two or more of these criteria. Organ dysfunction is now defined as two or more of the following - a respiratory rate of 22 or more, an altered mental state and a systolic blood pressure of 100mmHg or less. Let's illustrate this with an example. Some years ago I accompanied a group of retired men and women on a trek in the hills around Kathmandu. On the final morning, one of the trekkers failed to show up for breakfast. Visiting him in his room it was clear that something was wrong. I knew from his medical records that this trekker had a long term urinary catheter and was prone to infection. Despite prophylactic antibiotics, pus and heavily concentrated urine could be seen in the catheter bag. The trekker had a respiratory rate of 30 breaths per minute, was confused and had a systolic blood pressure of 90mmHg. Using the new consensus definition this man had sepsis. 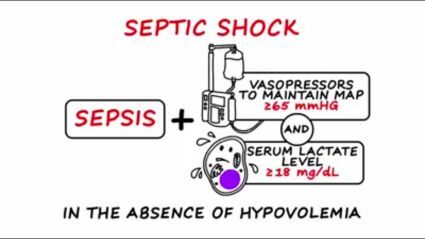 Septic shock is diagnosed when a patient has persistent hypotension that require vasopressors to maintain a mean arterial pressure (MAP) of 65mmHg AND has a serum lactate of more than 2mmol/l or 18mg/dl despite adequate volume resuscitation. But did he have septic shock? 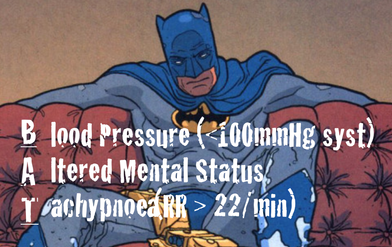 According to the consensus this is diagnosed when a patient has persistent hypotension that require vasopressors to maintain a mean arterial pressure (MAP) of 65mmHg AND has a serum lactate of more than 2 mmol/l despite adequate volume resuscitation. With the aid of a helicopter we were able to evacuate the trekker quickly to Kathmandu where the catheter was removed and intravenous antibiotics were administered. Despite 4 litres of intravenous crystalloid his MAP remained below 65mmHg whilst serum lactate measurements remained consistently above 2 mmol/l. Central venous access was obtained and intravenous noradrenaline was administered. Over the course of three days the trekker responded to treatment and went on to make a full recovery. Clearly the trekker was not only septic but had suffered an episode of septic shock. Why do we need definitions of sepsis and septic shock? It's a reasonable question - does it make any difference? Most people with an infection don't die. In fact the vast majority don't even come into hospital! However those with sepsis and septic shock do succumb from their conditions. Estimates vary, but it is believed that 10% die from sepsis and 40% die from septic shock. Clear definitions are vital to help identify those at greatest risk and provide them with the care they need. This is all a very long winded introduction to what I wanted to write about today. A recently published study in JAMA has made me look again at a very simple clinical tool. As mentioned above, a serum lactate measurement of more than 2 mol/l, despite adequate intravenous fluids, is a key factor in the diagnosis of septic shock. Serum lactate is also widely used as a tool to monitor the administration of crystalloids, albumin and other blood products in fluid resuscitation. Put simply, when the serum lactate drops below 2 mol/l fluid resuscitation is stopped. But what if this wasn't the best way to do this? What if there was another way to tell when fluid resuscitation was complete? The ANDROMEDA-SHOCK Trial recruited 424 patients with septic shock and studied two ways of monitoring intravenous fluid resuscitation during the first eight hours of treatment. The patients were divided into two groups and both were treated according to the policies of the admitting hospital. Where the two groups differed was in the way the effects of fluid resuscitation was measured. Whilst the "Lactate" group were resuscitated according to the results of 2 hourly serum lactate measurements, the "Peripheral Perfusion" group were assessed by capillary refill time (CRT) obtained every 30 minutes. The aim of fluid resuscitation was to either normalise or decrease serum lactate by 20% every two hours or normalise CRT. So long as the measurement remained abnormal, fluid resuscitation continued during the period of observation. CRT was measured by applying firm pressure to the ventral surface of the right index finger's distal phalanx with a glass microscope slide. 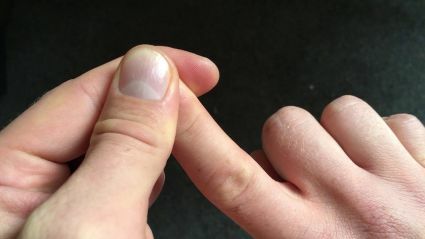 The pressure was increased until the skin was blank and then maintained for 10 seconds. The time for return of the normal skin color was recorded. A refill time of greater than 3 seconds was defined as abnormal. The researchers found that no matter what method was used - either serum lactate or CRT - there was no difference in the long term survival of patients or any other outcome that was measured. Therefore this study makes the case for using CRT to measure the response of fluid resuscitation in patients with septic shock. Please get in touch with us if you'd like a copy of the paper. Interesting read and also the ability to use a simple technique available to all in a non-hospital environment which is where we (in the outdoors/ mountains) often find ourselves in either a leisure or work related activity.... Keep them coming!